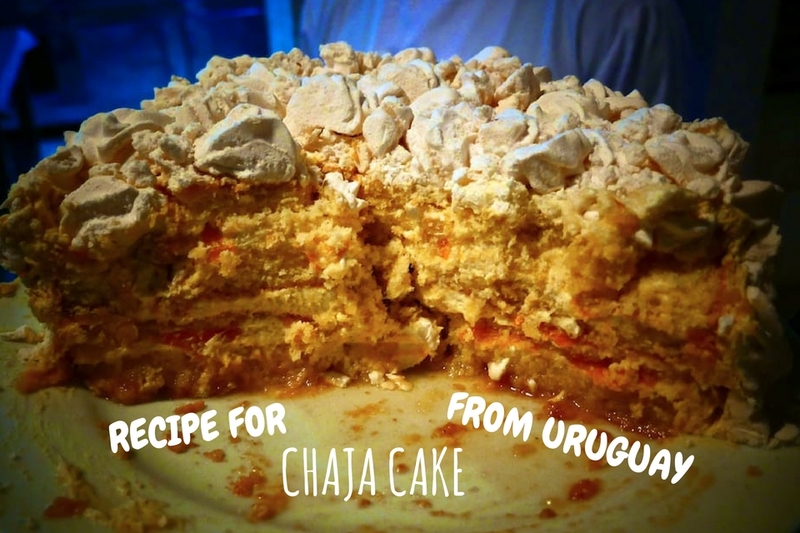 Chaja is the famous luscious and extremely naughty cake of Uruguay. 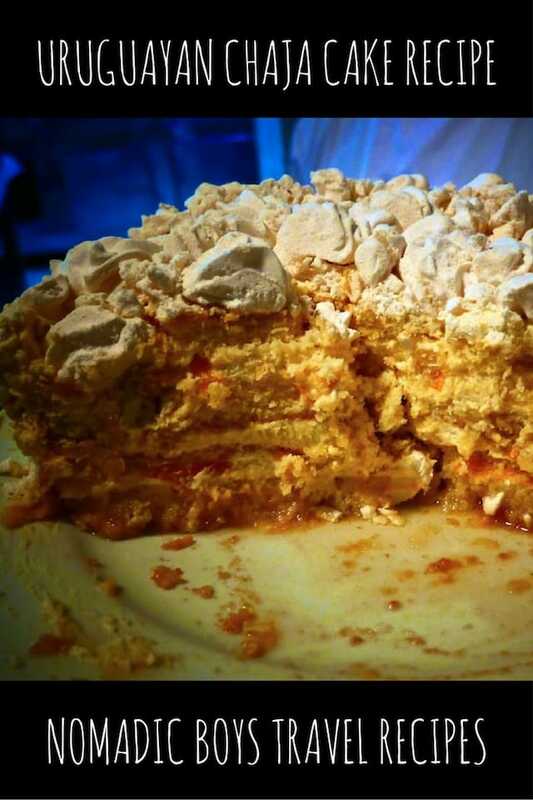 It is often described as a Uruguayan sponge cake filled with peaches and whipped cream. 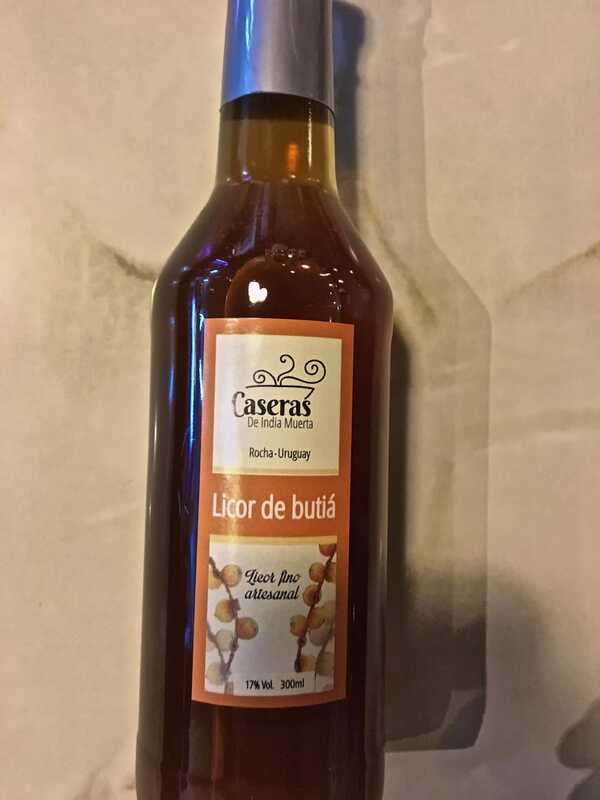 This is our recipe for Uruguayan chaja from our friend Charles Santos who has an excellent restaurant in Rocha called Parador Puerta de Rocha. 1. Pre heat the over to 180 degrees celsius and grease 3 small round baking pans. 2. To prepare the 3 cake mixture layers: in a mixer, combine 6 eggs, 200g of sugar and 1 teaspoon of vanilla until the sugar dissolves. Then fold in 100g of flour. 3. Place the cake mixture into the 3 baking pans so that they are round and flat. These will form the 3 cakes layers of the chaja later. Bake for 7 minutes. When done, remove from oven, set the 3 cake layers aside and let them cool. 4. Reduce oven to 110 degrees celsius and prepare another greased baking pan to bake the meringue. 5. With the remaining 8 eggs, separate the egg whites and disregard the egg yolks. In a clean mixing bowl, whisk the egg whites well for at least 10 minutes to get them meringue like and very frothy. The test to see if they're done is to turn the mixing bowl upside down: the meringue should not move. 6. Add 500g of sugar and whisk again for 2 more minutes. 7. Place the meringue mixture in the baking tray and bake for 1 hour. When finished, crush the meringue into small pieces and set aside. 8. Mix 500g of whipped cream with the 6 tablespoons of sugar. 9. Divide the canned peach and syrup into 3, ready to assemble the cake. 10. 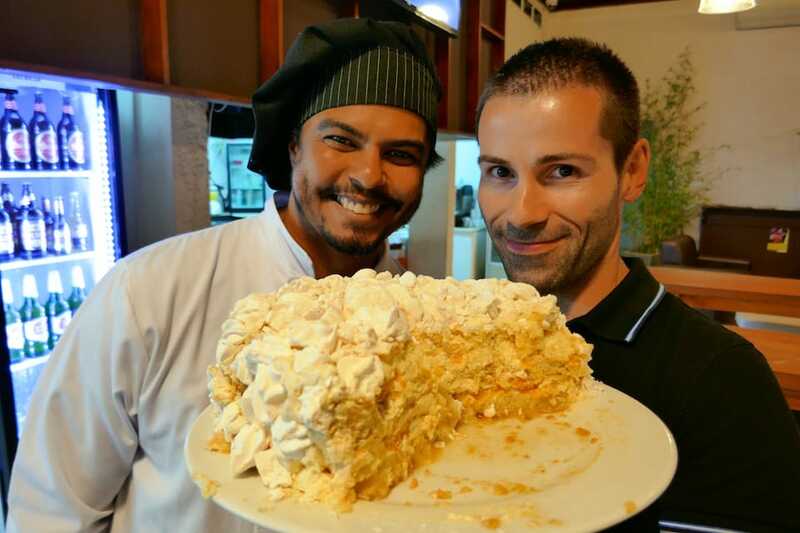 To assemble the cake, place the first cake layer on a plate and pour the first third of the peach syrup and lay the peaches on it, spread a third of the whipped cream mixture and finally a third of the crushed baked meringue. 11. Repeat this for the middle and top layers of the cake and cover the final cake with the remaining whipped cream and broken pieces of meringue.